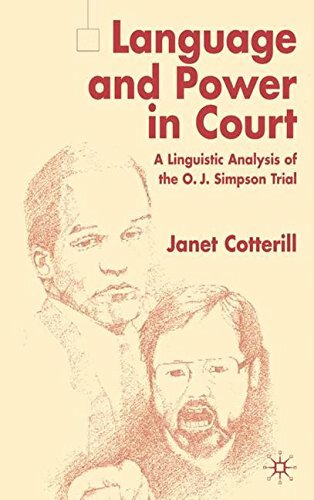 Sociolinguists and lawyers will find insight and relevance in this account of the language of the courtroom, as exemplified in the criminal trial of O.J. Simpson. The trial is examined as the site of linguistic power and persuasion, focusing on the role of language in (re)presenting and (re)constructing the crime. In addition to the trial transcripts, the book draws on Simpson's post-arrest interview, media reports and post-trial interviews with jurors. If you have any questions about this product by Janet Cotterill, contact us by completing and submitting the form below. If you are looking for a specif part number, please include it with your message.